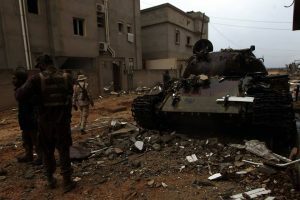 From early this morning, police cleared the roads of traffic between the front line at Ganfouda and Benghazi Medical Centre to give ambulances an unrestricted run as the Libyan National Army began it major assault on the terrrosit enclave. At least 24 soldiers were wounded in today’s fighting including the commander of the 298 Tank Brigade and one man is known to have been killed. Tomorrow the roads will remain cleared and Benghazi municipality has declared that all schools and most government offices will be shut. Today the army claimed to have destroyed the only tank in the hands of the terrorists. Pictures were posted of social media of the tank being struck by a rocket propelled grenade and then burning. Later shots showed soldiers posing beside the burnt-out hulk. It is thought that this tank was captured from the army during fighting in Garayunis in July. The military have also repeated a long-standing warning that it would sink any outside vessel that tried to reach the Ganfoud enclave. The army is maintaining a tight control on details of its operations but it appears that several areas of the Ganfouda district, including a large customs pound with containers has been overrun. There are no details for the number of terrorists nor civilians killed and injured in the fighting. There were reports that six militants had been captured early today but no pictures nor further information has appeared. It has been a prime concern of both UNSMIL and NGOs including Human Rights Watch that civilians trapped in the terrorist enclave were at risk from the fighting. Benghazi Revolutionaries’ Shoura Council published photos of a child killed in an air raid and a month ago a group shot of children holding up signs saying they were not getting enough to eat. The army has always maintained that it was prepared to let civilians leave the area provided that they could be searched to confirm their identities. This the BRSC and its IS and Ansar Al-Sharia terrorist allies apparently refused to permit. The International Criminal Court has also latterly involved itself saying that it would be watching for war crimes committed against civilians.